Oh man, this recipe is going to blow you away! If you love pizza and muffins, and you're looking for a two-in-one, this is it! These Pepperoni Pizza Zucchini Muffins are great for on-the-go and can be tailored to your liking! They are moist, dense and extremely filling! Watch me make them below so you can make these today. Why We Love Easy Muffin Recipes! Why are savory muffins so easy to make? Alll you have to do is combine everything, plop it in a muffin tin and bake. You'll get a perfectly constructed and delicious muffin every time. These zucchini muffins in particular have a great base of egg, zucchini and cheese that allows you to flavor it with whatever additions and seasonings! We went pizza style, but you can do it caprese style with mozzarella, chicken and cherry tomatoes or like your favorite hamburger with mini pickles, ground beef and bacon. The possibilities are endless! No One Likes Dry Muffins! You may not know it, but this recipe gives you the secret to moist muffins every time, and the secret is zucchini! Grated zucchini bakes into the perfect muffin and bread, minus the flavor of zucchini, plus the moist texture of the best baked goods! It works for savory and sweet. You've got pepperoni pizza zucchini muffins on one end and brownies on the other end. Equally as moist, equally as delicious! Bite-sized anything is pretty much a huge hit in our household. It's easier to track our overeating that way haha. We've even got Keto Muffins for the perfect on-the-go breakfast, and No Bake Cashew Cheesecake for an easy, bite-sized dessert when you don't want to risk eating an entire recipe! Sweet treats are always fun to have around, but not always the best if you're working on your eating habits. If you are looking for something to fill that muffin void, be sure to give these Pepperoni Pizza Zucchini Muffins a try! 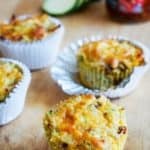 Recipe can be quickly added to MyFitnessPal - Search "KetoConnect - Zucchini Muffins"
Grate zucchini into a bowl and remove any excess liquid in the bottom of the bowl from the zucchini. Add the eggs and combine. TIP: You can also squeeze out the liquid from the zucchini with your hands for a less densely moist muffin! Add coconut flour and baking powder and combine. Grease a muffin tin and scoop some of the mixture into each muffin tin, filling it to the rim. Sprinkle with additional cheese.